WordPress 4.7, codenamed “Vaughan”, was released on December 6, 2016. Existing WordPress users can push the update button to upgrade to the latest version. 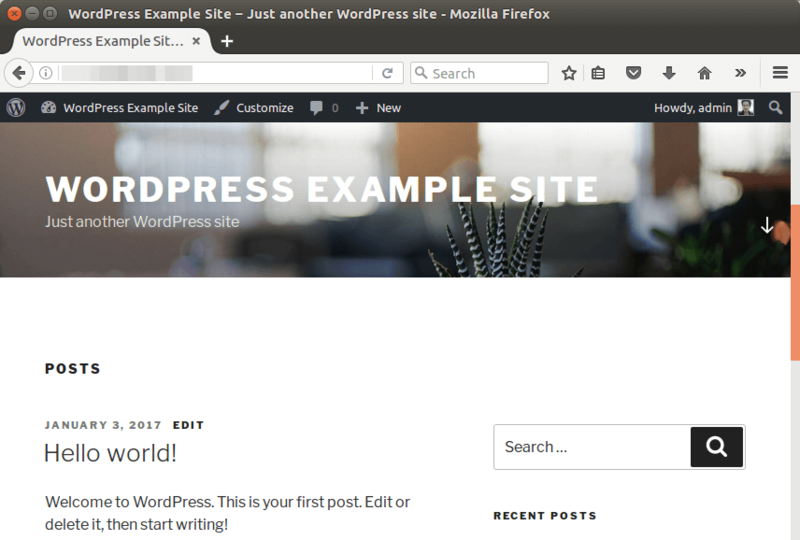 This tutorial is going to show you how to install a new WordPress 4.7 instance on Ubuntu 16.04 with Apache, MariaDB and PHP7. This tutorial assumes that you have already set up a LAMP stack on Ubuntu 16.04. If not so, please click the link below to check out the LAMP tutorial. After finishing LAMP installation, come back here and read on. Log into your Ubuntu 16.04 VPS or server via SSH, then update all software. Once downloaded, extract the archive using the command below. A new directory named wordpress will be created in the current working directory. Now We move this directory and all its content to Apache web root. Replace your-site.com with you real domain name. Log into MariaDB shell as root. Please note that this is the MariaDB database root user, not the root user of Ubuntu 16.04 system. Then run the command below to log into MariaDB shell. Once you are logged in, create a database for WordPress using the following command. I named it wordpress, but you can use whatever name you like such as you site name. Then enter the command below to create a database user for WordPress. This command also grant all privileges on WordPress database to the user. Flush the privileges table for the changes to take effect and then exit out of MariaDB shell. Go to your WordPress site installation directory. Copy the sample configuration file. Save and close the file. We also need to set the Apache user (www-data) as the owner of the WordPress site directory using the following command. First, cd into /etc/apache2/sites-available/ directory. Then copy the default virtual host file. Next, edit the virtual host file for WodPress. Change the values for ServerName and DocumentRoot like below. Save and close the file. Then test configurations. And reload Apache for the changes to take effect. Set a correct A record for your domain name, then enter your domain name in browser address bar. You shall see the WordPress installation wizard. Select a language. If the installation wizard isn’t displayed, then you probably should install some PHP7 extensions. Then reload Apache and the wizard should be displayed. And now your new WordPress site is ready. To enable HTTPS connection on your WordPress site, you can use Let’s Encrypt. First, install Let’s Encrypt client (cerbot) on Ubuntu 16.04. Then run the following command to install a free TLS certificate. 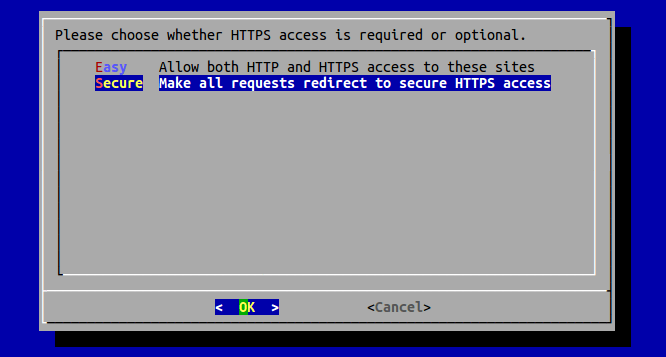 Once you hit the OK button, a free TLS/SSL certificate is obtained and installed on your Apache server. Now visit your WordPress site again. 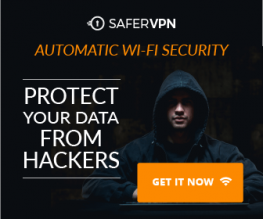 You will see that it’s automatically redirected to https. 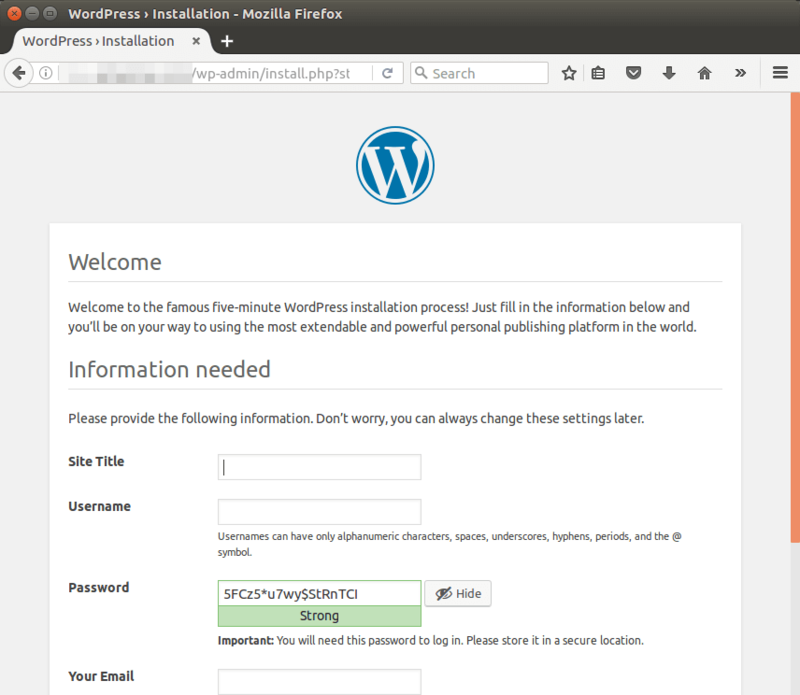 I hope this tutorial helped you install WordPress on Ubuntu 16.04 with Apache, MariaDB and PHP7. As always, if you found this post useful, then subscribe to our free newsletter. You can also follow us on Google+, Twitter or like our Facebook page. Just wondering could you do a tutorial on setting up a multi site wordpress on the same server ?